She brings a class of her own to the Maldivian waters and, in the words of a recent guest, "a fabulous crew, they have done everything possible to make us enjoy the wonders of the Maldives". 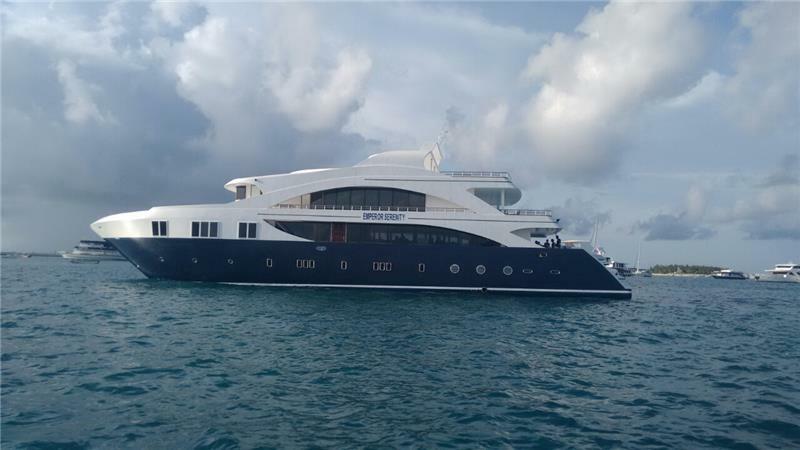 Emperor Serenity is a contemporary, spacious liveaboard where fine accommodation and service is standard. This 40 metre boat easily accommodates 26 guests in 13 well-appointed ensuite cabins all with air-con. Enjoy open air dining area at the stern of the main deck. Several sofas and tables await you inside the air-conditioned saloon for relaxing or watching TV. A complimentary glass of wine is served with dinner. The Upper deck boasts a covered and open area ideal for watching photos and footage from your diving or just relaxing, star gazing and soaking up the wonderful Maldivian atmosphere. The sundeck is perfect for catching those sunrays or having a nap. All diving is done from Emperor Serenity's large dhoni tender, giving you more living space on board and getting you to the perfect dive spot every time.